Some jobs are just riskier than others. Take hang-gliding instructors. Or high-rise window washers. Or lion tamers, bear trap testers or even fireworks packers. But those pale in comparison to the riskiest industry in America: the dental industry. According to a study conducted by Business Insider, the dental industry has five of the top ten unhealthiest—and thereby dangerous—professions among 974 occupations. By using a database supplied by the U.S. Department of Labor, and analyzing health impacts in six categories—exposure to contaminants, exposure to disease and infection, exposure to hazardous conditions, exposure to radiation, time spent sitting, and risks related to burns, cuts bites and stings—researchers were able to tabulate scores on a scale of 0 to 100, with 100 being the highest risk. In the top ten, Prosthodontists, who construct oral prostheses, came in at number 7 with an “unhealthy” score of 63, due to high scores in exposure to disease and infection (88), exposure to contaminants (74) and time spent sitting (66). Dental Assistants came in at number 5, with an overall score of 65.5. The profession ranked high because of exposure to disease and infection (a score of 96), exposure to radiation (85) and exposure to contaminants (78). Dental Laboratory Technicians followed on the heels of Dental Assistants at number 4 with a score of 65.7, with an exposure to disease and infection score of 72, a time spent sitting score of 85 and an exposure to contaminants score of a whopping 99. General Dentists came in at number 2 with a score of 69.5, owing to high subscores of exposure to disease and infection (95), exposure to radiation (85) and time spent sitting (82). And coming in at number 1? Dental hygienists, with an overall score of 72.8 (exposure to disease and infection a full 100 points, exposure to radiation at 91 and time spent sitting at 85). 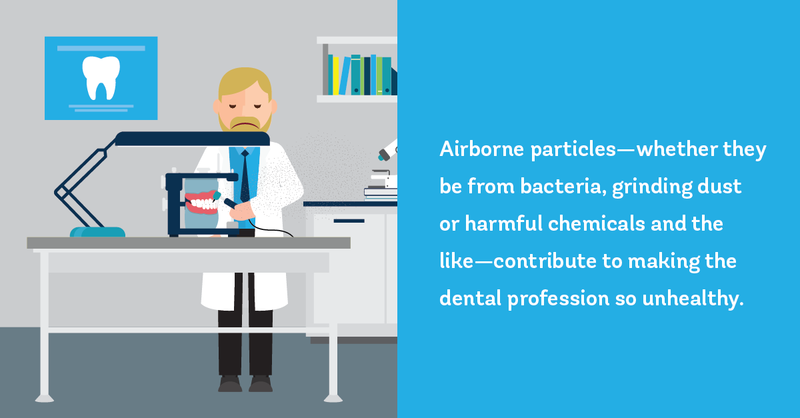 Clearly, airborne particles—whether they be from bacteria, grinding dust or harmful chemicals and the like—contribute to making the dental profession so unhealthy. One way to significantly improve indoor air quality in dental labs and offices relies on installing AeraMax Professional air purification units. 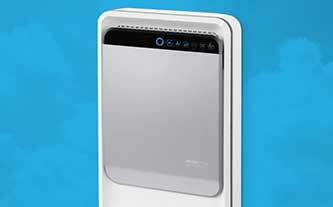 These purifiers employ True HEPA filtration, removing up to 99.97 of airborne contaminants, like dust, allergens, chemicals, VOCs and bacteria from indoor air automatically. So, contaminated air, like that in high-volume dental offices and close-quarter dental laboratories, can be scrubbed of harmful particulate, ensuring the health and well-being of workers. Read more from Business Insider, “The 47 jobs that are most damaging to your health”.